A generous portion of lamb shank, cooked to perfection in a savory wine sauce. Served with Greek-style orzo, Greek-style green beans and a dinner roll. A festival signature entrée. Chicken breast marinated in lemon, olive oil & a special Greek spices, cooked to perfection over an open flame. Served with Greek-style orzo, Greek-style green beans and a dinner roll. Layers of noodles, seasoned ground beef and Romano cheese, topped with a creamy, decadent béchamel sauce. Served with Greek-style green beans and a dinner roll. A festival signature entrée. A single serving of the Mediterranean’s famous spinach pie. Layers of flaky phyllo dough wrap a blend of spinach, onions, feta cheese & herbs. With produce fresh, our Greek salad is a generous mixture of Romaine & Iceberg lettuces, tomatoes, cucumbers, dill, Spanish onions, Kalamata olives, crumbled Greek feta cheese and finished off with Olive Tree Greek Grill’s famous Greek Dressing. Layers of noodles, seasoned ground beef & Romano cheese, topped with a creamy and decadent béchamel sauce and baked to perfection. Green Beans culled from the vine, baked with crushed tomatoes, onions & a flavorful blend of savory spices. A festival signature side dish. An Orzo pasta prepared the Greek-way with A delicate mixture of crushed tomatoes & savory Mediterranean spices. A festival signature side dish. A combination & selection of rice-filled Dolmathes, Loukaniko (Greek Sausage), Greek Feta Cheese, Kalamata Olives and Pita Bread. Grape leaves from the vine, stuffed with rice & spices. Vegetarian & Vegan. Always festival Signature! One of our finest Greek appetizers, watch as we fry and flambé a thick slice of kefalograviera with Greek brandy and lemon juice! OPA! A portion of our homemade, creamy greek yogurt & sour cream sauce, with notes of cucumber, garlic & dill. served with warm pita bread. A mildly-smoked 100% pork Greek sausage, infused with orange rinds, wine, fennel seeds & exotic spices. drizzled with lemon & oregano. 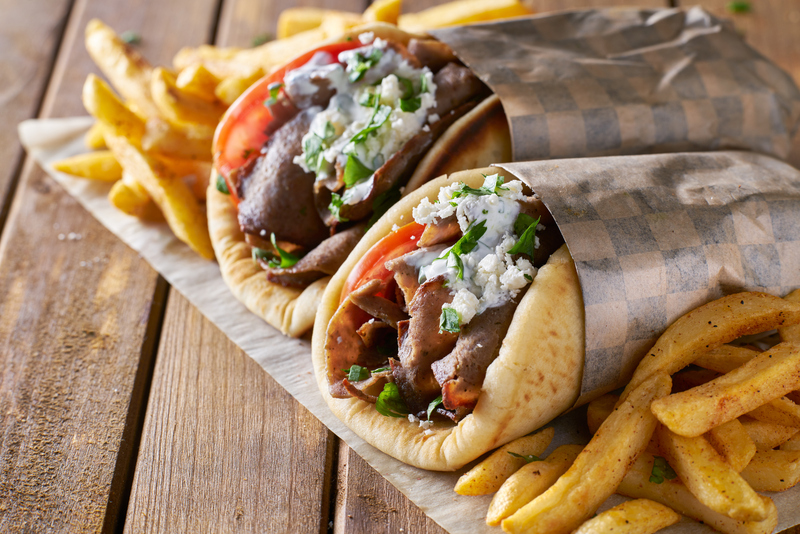 Slices & shavings of a seasoned lamb & beef blend, wrapped in a pita bread and topped with tomatoes, onions & our creamy, cucumber-based Tzatziki sauce. A combination of gyro & grilled chicken breast, wrapped in a pita bread and topped with tomatoes, onions & our creamy, cucumber-based Tzatziki sauce. Grilled chicken breast marinated in a lemony sauce and topped with tomatoes, onions, crumbled feta cheese & our creamy, cucumber-based Tzatziki sauce. Slices of grilled & marinated chicken breast, wrapped in a pita and topped with tomatoes, onions & Tzatziki sauce. Lettuce, diced tomatoes & onions, wrapped in a pita and topped with our creamy Tzatziki sauce. Greek-style, marinated pork cubes skewered and cooked to perfection on the grill. Served with a pita bread. Cut potatoes served sprinkled with crumbled feta, oregano & Greek seasonings. Cut potatoes salted & served the traditional way!